Looking at the product video, it looks like the minimum temperature of the heating pad 5x15cm was about ~120Â°F in open air and around ~130Â°F/140Â°F @ 5V and 0.6A. The maximum temperature of the heating pad can probably reach just over ~240Â°F-246Â°F @ 12V (based on the results of the smaller 5x10cm heating pad) and it will start warping the plastic. Any voltage higher will result in the pad breaking and damaging the product. 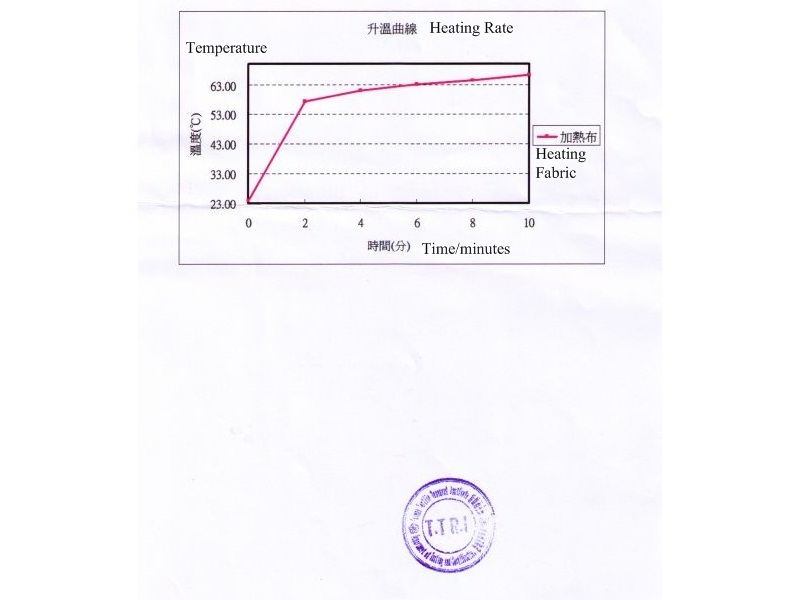 We can expect the 5x15cm heating pad to be around the same temperature or slightly above the the results of the smaller heating pad due to the bigger surface area for the 5x15cm heating pad. I had a customer use the 5x10cm heating pad for their project to heat a horse bit up. A 9V battery didn't work as well and it was getting hot to the touch. The heating pad was putting out less heat when the battery was overheating. 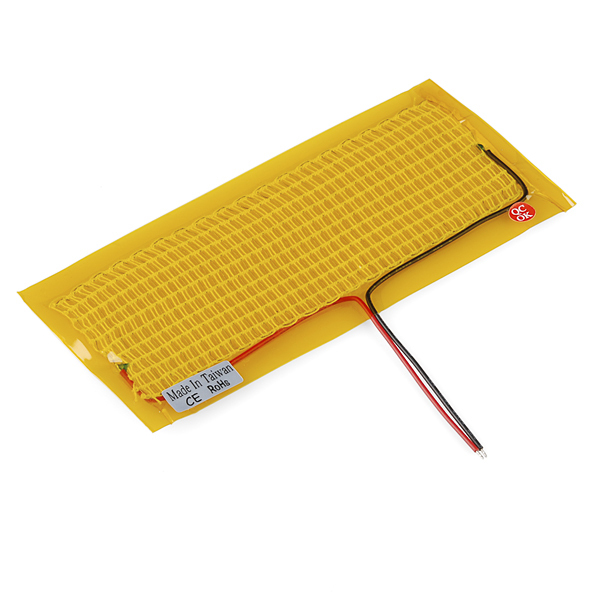 He then used 4 AA batteries (for about 6V) in a battery holder https://www.sparkfun.com/products/12083 and didn't have a problem using it. So these act sort of like resistors, right? In that case, is the temperature proportional to the power (watts) or does it have some other strange behavior such as the voltage controlling the temperature and the current controlling the speed that it heats? I tested two large heating pads, recently purchased and they do NOT meet published specs. Using a 5 volt supply capable of 2.4 amps output rating and used two separate thermometers (one digital with themocouple and the other glass mercury) and the maximum temperature reading I got after ten minutes was only 33 degrees Celsius. According to the temperature profile it should reach over 60 Celsius. A far cry from the published specs. The manufacturer in China probably stuck Sparkfun with some sub standard product. I used a 12 volt power supply which brought the temperature to 70 Celsius. I once installed heating pads similar to these under motorcycle grips. They kept my hands nice and toasty when the mercury plunged. I preferred them to pricier integrated heated grips, as I could continue to use whichever grips I liked. This heating pad seems to be about the right size for that application. Attach to the bars with hairspray and add a rheostat to control the temperature. Take power from a circuit that is powered only when the ignition is on (e.g., brake lights), so you won't drain the battery if you forget to turn off the heating pads. If the bars are hollow, you could run the wires inside. That's brilliant. I might do that with my bike. Wow, I can't believe Sparkfun sells this product. Not cool, guys! Also, what's the current draw on this? If it's not cool, it's hot. Hey, got a couple questions that I hope some of you can answer. Iâm looking to install some of these in clothing, are they washable? Can I run these through a lilypad arduino board and a 5v battery with enough heat generated to feel through fabric? If anyone can answer either one of these questions that would be great, thanks! What? It clearly says that it's powered by 5V. "The fact that these are low power, flexible and draw little power makes them ideal for things like hand-warmers and other heated garments. Maybe hook up a microcontroller and some sensors and make your own climate-controlled hoodie?" NO!...you mean: "these are great to keep your electronics warm on your HAB proyects... or Higher." can i program this to turn on/off using a push button and arduino? Or is there a better method? How easy would this be to control via, say, PID (PWM, of course)? I need this to be constant +- 0,25 degrees. I do have a precise sensor. To clear up, I'm asking how proportional is the temperature to the voltage? Will its temp at, let's say, 50% PWM be constant? Would running this through a washing machine cause any problems? I am planning to use these in my gloves, would removing the plastic layers cause any damage? Would there be any danger of directly touching the internal conducting threads to skin when the plastic layers are removed? Thanks! I'm thinking these might work as mirror heaters for my telescope to get rid of condensate. Looks like they might run a little hot though. Maybe hook two in series and run them off a 9v battery with a pot. Shouldn't be too hard to wrap a couple of these around the primary on the inside of the tube. An arduino might be a little overkill to regulate the temp though. Since these are basically fixed resistors, and thus subject to Ohm's law, you can regulate their temperature by reducing the input voltage, or chopping the input (PWM or more simply, turn it on until it reaches your desired temperature, turn it off, repeat). You could reduce the input voltage from your main supply (12V car battery?) with an adjustable regulator such as the LM317. This won't be hugely efficient, as the regulator will get hot itself, but it's easy to do. Good luck on your project and let us know how it goes! These pads draw 0.7A at 5V. I think a 9V battery would be depleted rather quickly (~1 h). I looked around, but could not find a datasheet for these products; if they have one, it's apparently not available to the general public. Is there any way of obtaining one, or at least getting a plot of current vs. expected temperature? 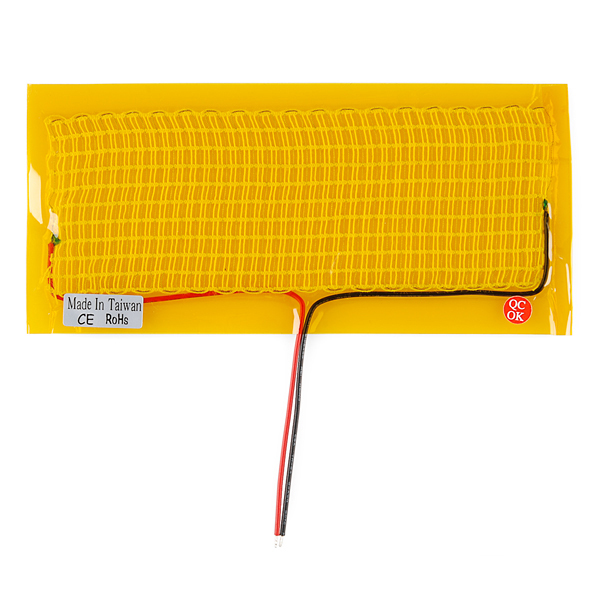 These pads will draw 0.7A at 5v for 3.5 watts and about 7.14 ohms. At these ratings with a 23C ambient temp, this pad will reach ~70C. I cant remember exactly what the equation, but the temp is proportional to the power input minus the power dissipation, which is exponential/related to the surface area of the pad and the ambient temp/heat resistance of the surrounding medium. if you can get these variables and find the equation (try something like "calculating power dissipation" on Google), you should be able to get data-points for current (and because this is restive, voltage)/ temp at at specific ambient temperatures to air. I am thinking about using two of these to warm a solar battery bank in an insulated box. I live in Michigan and my battery bank is in a detached garage where temp can drop below freezing quite often. I have a DC charge controller and am thinking about wiring two of these pads off the 3V DC port. The controller has direct DC outputs and should recharge the less than amp draw. Any thoughts? I am also looking for a dc temp controller to automatically monitor the temp so I am not drawing power unless needed. I am not sure if this type of temp controller for dc exists. Any help is appreciated. You can use a Microcontroller, temp sensor, and a MOSFET as the temp controller. You can use a simple Proportional control in your microcontroller code. Could we get a measurement on the weight and resistance of this product? The first thing that came to mind for me was heated seats in my car. Just peel back the fabric and tape these things down. My question is whether these could hold up to both the direct pressure and the rubbing involved. Could I get an answer to how durable these things are? Thanks. How exactly do these work? I'm trying to figure out if I could create a temperature control using a variable resistor. Do these generate heat through resistance, or some other method? They work through resistance, yes. So you should be able to vary temperature using a resistor, supplying a lower/higher voltage, or even PWM. is it possible to waterproof this heater? I measured 5.7 ohms on the larger 5 x 15 cm pads. The maximum temp I got with 5 vdc supply was 33 degrees Celsius which is way below spec (should be over 60 C after ten minutes. I used a digital and a glass mercury thermometer. 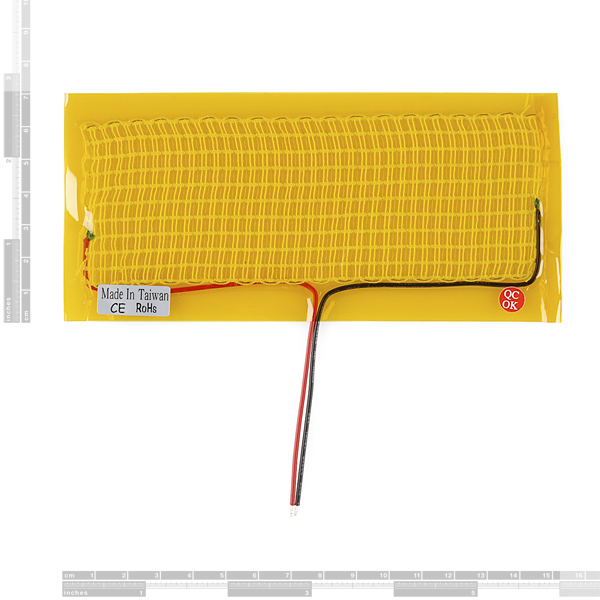 If I used a 12 vdc supply I measured 70 C.
I'm wondering how well this would work as a heating element for a RepRap build platform. Are they available (anywhere) in larger sizes? Say 20x20cm? I did order two of them to try that on my Huxley so I hope they work. But I get the feeling they might not be good enough for abs. But I am sure 80c is better than no heated bed. 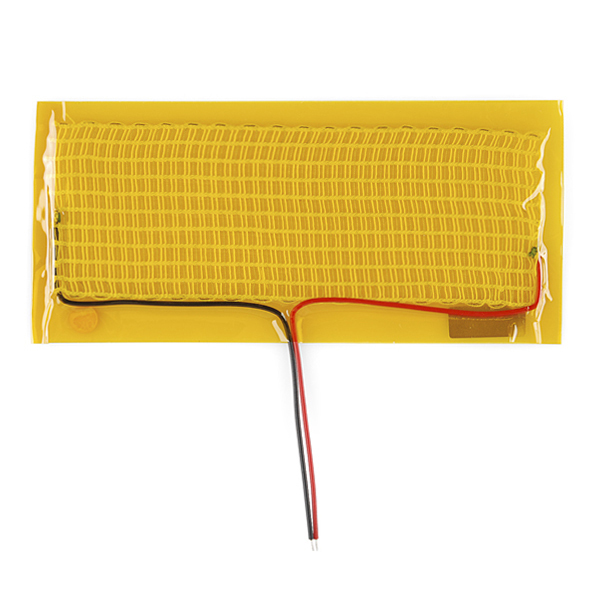 My thought on these is to use as a Lipo battery warmer for my weather station on the roof in the winter time. I have Blepharitis (dry eyes) for which one the treatments is low heat with the eyes closed. The microwave heat packs sold for that purpose are a pain. Been looking for a small battery powered heating pad to use, but haven't been able to find a commercial version. This heating pad works out great for that purpose. I made a light fabric cover for the pad, and have it running on 2 18650 batteries. The pad conforms well over both eyes. Works out very well and is inexpensive. I was looking for a cost effective way to keep moisture from building on my telescopes collector plate and these worked perfect. A heated dew shield with its power supply are well over 100$ but with these heating pads some bubble wrap, tape and an old spare universal power supply I made my own for less than 10$. I CAN ADAPT IT TO WORK WE DO ON OIL WELL WELLHEADS, ALL OVER THE WORLD. I purchased one of these heating pads to test its heating efficiency. The idea was to use it to keep a LiPo battery warmed to within it's efficient temperature range. It would have been very helpful to have more data on the product such as how much current it draws both over time and at various temperatures and voltages, but I was unable to find this information. Because of that, I am going to have to perform extensive tests on my own to determine weather it is efficient enough to do what I need or not. To that end, it does not appear that it is, but I am still performing tests with the unit at room temperature, in a freezer with a known temperature range and later it will be tested packed in dry ice. I combine them with a PID controller for creating precise 95F skin temperature surfaces for insulation testing. They work great in this application. It works fine and the delivery has been on time!